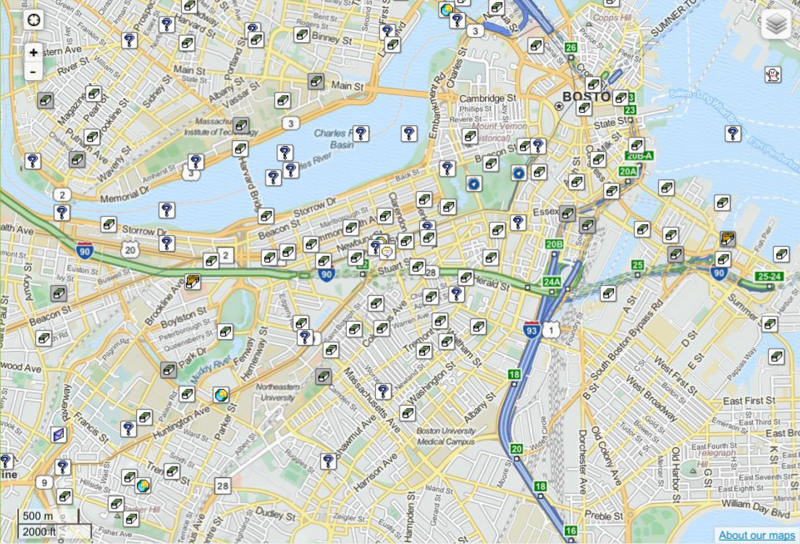 I’m planning to do a little Geocaching at Red Hat Summit next week, and would welcome some company. Let me know. Hopefully RHSummit will be better than OpenStack Summit, in terms of not spending the entire week sick in my room. Well, I *planned* to go geocaching at OpenStack Summit, but it really didn’t work out. Almost every moment that I wasn’t working the expo hall, I was in my hotel room, in bed. Yes, I spent most of OpenStack Summit week sick, and didn’t get out of the hotel much. However, I did get out to go Geocaching one morning on the way over to the convention center, and I found Canada Place Cache, my first cache in many moons, and my first cache in Canada. I also looked for Barrel of Trees, which I didn’t find because the place was overrun with muggles and I never got a chance to go back. What was really cool, though, was how many OpenStack enthusiasts approached me either at the event, or online, saying that they were also planning to go geocaching, and thanking me for making them think of it. I always like to find out the *other* hobbies of the people I know in the geek world. That is, their hobbies outside of the particular technical discipline we share. It makes people more human, and way more interesting. So, stay tuned, and come geocaching with me at Red Hat Summit, and at OpenStack Summit in Tokyo. 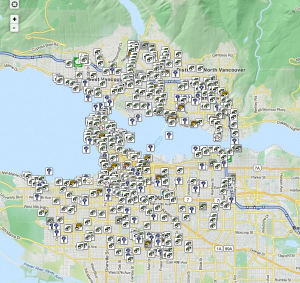 Coming to the OpenStack Summit in Vancouver? It looks like there’s a lot of caches around the summit location. This map shows the 500 closest. I keep meaning to spend a little time at conferences walking around the area and geocaching. Perhaps if I have a few folks with me I’ll see more of it, and meet some interesting people as well. 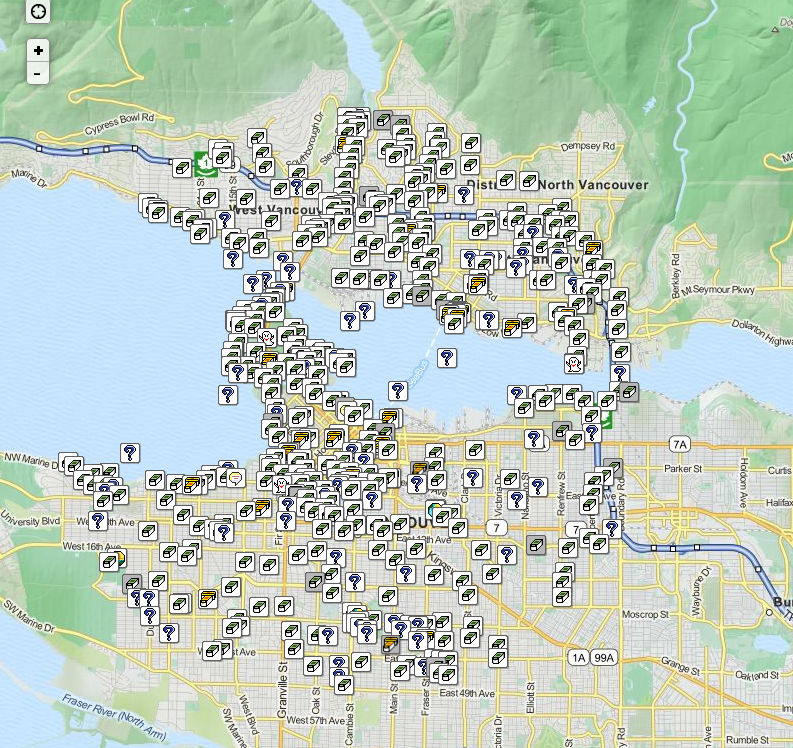 If you’re interested in Geocaching in Vancover, let me know, and we’ll try to set something up. I’ll be there from Sunday night (May 17th) through Thursday night (May 21st), and although I know it’s an incredibly busy week, I expect we can find an hour or two free in there somewhere. 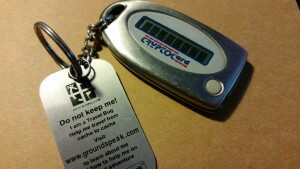 I’ll also bring my new CryptoCard travel bug to drop off somewhere, since all of my other travel bugs have long since vanished. I’m also hoping that by the time Red Hat Summit rolls around, I have some special Red Hat community project geocoins to accompany our geocaching outing. If this works out, I’ll try to make it a regular feature of my conference trips. So, here’s hoping. While the Jeep was getting fixed, someone went into it and forced open the center console where I had, among other assorted junk, my ancient GPS receiver. I bought it in the early days, when GPS technology was first available to civilians. I paid an enormous amount of money for it, and, by today’s standards, it hardly did anything at all. But it kept me sane for a couple years, giving me something to do in those endless days and hours. This weekend, we went up to spend some time with Skippy, and while there, I found a refurbished TomTom One for about half of what they’re going for new, and we snapped it up. I’m completely blown away by what a low-end device like this can do. It’s got street-level maps of the entire USA. It does turn-by-turn routing, and reroutes if you choose to ignore its advice. It tells you where the nearest restaurants are. And all sorts of other useful things. So, today, after more than 3 years of not Geocaching at all, we went out and found four caches, and did maintenance on one of mine that’s been disabled for a while. It looks like we might get back into geocaching again, which would be cool. I’ve enjoyed it for a long time, just my schedule the last few years has made it very difficult to make time for it. Jenn has discovered a new form of extreme geocaching, GeoCrashing!. I haven’t been caching in a long time, and now my GPS is not cooperating. Perhaps I can find a way to get a new one some time soon. The trouble is that I have acquired rather expensive tastes in GPSes, and probably wouldn’t be satisfied with one that I could afford right now. So I’ll wait a little longer. On July 7, 2003, I left a travel bug in a geocache in the woods near Portland Oregon, where I was for the O’Reilly Open Source Convention. An identical travel bug, I gave to a fellow cacher who I met there at the conference. The travel bugs were small hand painted fishies on golden strings. Then, in February of this year, the other fish, named “Finding Sarah” arrived home, having travelled 3859 miles. It arrived just in time for Sarah’s birthday. So, rather than go straight out there and pick it up, I waited for Sarah’s birthday, and we went out there together. When we arrived at the site of the geocache, we discovered that the park service had, the day before, cleared a lot of brush and trees, including the one in which the cache was hidden. There were bits of the cache laying about, showing that the cache, and its contents, had been destroyed. After waiting more than two and a half years, the fishy was history. On Wednesday of this week, I received email from a cacher saying that he had retrieved the cache from the park maintenance crew who did the damage, and who had been hanging on to it since then. Perhaps they didn’t know quite what to make of it? I dunno. Anyways, yesterday he dropped of our little fishy in the new Bush Baby cache, and the journey was complete. This morning I went out and retrieved it, rather than giving it another moment to potentially get muggled. And now both fishies hang together in my kitchen. Travel Bugs are a *very* cool way to travel, vicariously, and get a tiny glimpse of the world. And they’re a great way to get kids interested in geography. After geocaching for about 5 years now, I find that I’m much more interested in travel bugs than in the caches themselves. Now that this one has come home, we’ll probably be sending out a LOT more of them, to see what happens. We’ve got 9 of them out in the wild now, and it’s always fun to get the reports of where they’ve gone. I hear that, in the old days, people would blog without the benefit of computers or the Internet, using paper and ink. I’m not sure whether to believe these bizarre stories, but it’s an amusing idea. I am in the woods, far from other people. I haven’t seen another person for about half a day, and can hear only the birds and insects. Shadow, my loyal companion, is here with me. And so, without the aid of a computer, I will write of several of the ideas that have beecn clamoring to get out, these last few months. Mr. Bradbury tells me that I must write these things with haste, lest they go away and never return. Without Mr. Bradbury, I surely would not have written as much as I have, so I am obliged to follow his instructions. I’ve been caching all morning, and had perfectly terrible luck, finding less than half of what I looked for. (5 finds, 8 not-finds.) In several cases there was construction on the site, and in many others, there was some kind of event going on, and dozens of muggles were on the spot. And a few caches were just gone. But at least I found a few. I went caching this evening. Didn’t find anything. I also discovered that the problems that I’ve been having with my Magellan appear to have more to do with the serial port on the ancient computer I’m using, than with the GPS itself. I tried using the USB Keyspan serial adapter thingy, and not only did it work great, but it worked considerably faster than the serial connection is supposed to work. I wonder how much speed I can coax out of it. Update: It looks like 19,200BPS is as fast as I can push it, but it’s still a step up from what I was able to do before. I wish I had done this a long time ago.